Approaching the Mt. Gretna Tabernacle, it is hard to imagine a building more perfectly adapted in design and construction to its purpose of sheltering audiences from the summer sun and rain. That need for shelter from August heat and storms is what led the Campmeeting managers, at the Annual Meeting in August, 1898, to appoint three of their members, William Ulrich (who also served as superintendent of grounds), J. H. Seltzer, and J. R. Meredith, to recommend a contractor who could erect such a building. The committee chose John Cilley, a Lebanon entrepreneur and self-educated carpenter and designer. Cilley had already produced several circular auditoriums (one of them for the Pennsylvania Chautauqua Association a few years earlier) to his own unique design. 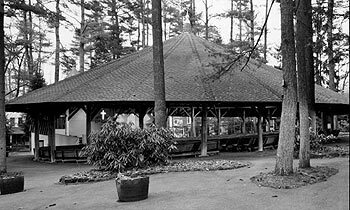 In May of 1899, Cilley was commissioned to erect an auditorium in the Campmeeting grove, a task which he completed by the end of July at a cost of $1132.60. Supported on 23 chestnut posts and braced internally by a spider web of wooden trusses all converging on a central tension ring, the structure invariably carries the eye upward from the podium to its topmost point. Turned over to the Assocation on August 1, 1899, the first services were held the very next day, led by Rev. D. D. Lowery. Dedicatory services were held Sunday, August 6, with Bishop E. B. Kephart preaching. Presumably, the seating arrangement was still the backless plank benches; the benches in use today are a later addition. The structure today is essentially what John Cilley designed and built, although it has had several new roofs. After the harsh winter of 1993-94, when campmeeting officials and residents combined forces to shovel heavy ice and snow from the roof, the building was reinforced at several points. An engineer checks the building for structural integrity each spring. 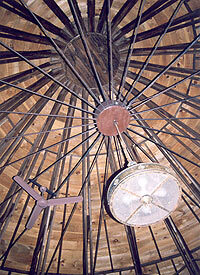 Beneath the Tabernacle's time-mellowed rafters, glorious memories linger. In recent years alone, such noted preachers and scholars as Bruce Metzger, Robert Kettering, Kenneth Gibble, James Singer, Elisabeth Achtemeier, Thomas Long, Myron Augsburger, Patricia Brown, Thomas Tewell, Edward Zeiders, Kirby Keller, Thomas Short, and from Scotland, William Henney, have appeared during the Bible Festival's core mid-summer weeks. Sunday evening performances have ranged from instrumentalists to the massed choirs that climax the two core weeks. Over the more-than-125 years styles of music and worship have varied, but the Word has been the same. God's redeeming love and concern for his people are preached and reflected on anew each summer in the beautiful Mt. Gretna hills. Have comments, suggestions of ideas for planning events? Contact us here.